Salome is not one of the women in the New Testament that one is likely to hear mentioned frequently. This lady was a follower of Jesus and had the honor of being among the first to learn of his resurrection. Prior to that, she cared for his needs in Galilee. Because Barack Obama has cursed Israel at the United Nations, America is now under a curse. Friday’s stunning betrayal of Israel at the UN Security Council is making headlines all over the planet, but the truth is that what Obama has just done is far more serious than most people would dare to imagine. Over the past several decades, whenever the U.S. government has taken a major step toward the division of the land of Israel it has resulted in a major disaster hitting the United States. This keeps happening over and over again, and yet our leaders never seem to learn. And despite the fact that President-elect Donald Trump, Israeli Prime Minister Benjamin Netanyahu and prominent members of both parties in Congress strongly urged Obama to veto Security Council resolution 2334, he went ahead and let it pass anyway. It is my belief that God has supernaturally intervened in this 2016 election season. Donald Trump simply would not be in the position he is in without the help of Wikileaks and the power of the alternative media. Truly a perfect storm has disrupted the corrupt Clinton machine from rigging the entire election. Those leaked emails and the ability to publish them outside of the lapdog Clinton media has made all the difference in the world for the Trump campaign. This truly has been a historic election season. I have to say watching the collapse of the corrupt House of Clinton has been the most fascinating lesson in morality and theology one could ever ask for. I, by no means, am saying that God is a Trump fan, hardly, I make mention of this only to point out the greatest spiritual lesson from this election season, which is God is a judge of nations and kings. Watching the Clintons fall is a telling illustration of how God can bring the wicked to their knees by means that aren’t even fathomable to our human minds. Truly God raises up one and will put down another. One thing about the Clintons is they are polished politicians. They have spent many years cultivating the perfect altruistic liberal-image. Hillary Clinton, in her debates, is always evoking the children with her answers on policy questions. On gun-rights we must ban them for the children, with her war with Assad she says look at all the children being harmed, on abortion she hypocritically says we must murder the un-born up to the 9th month lest they grow up in poverty, figure that one out. Their emotional appeals are there only to create an illusion of morality that suckers enough people into actually voting for them when they need the votes. But thanks to Julian Assange and Wikileaks who had the courage to face their wrath, published those emails, and the facade is now starting to fall away. The public is beginning to see how they have preyed upon tax-payers, controlled the media, have had disdain for their constituents, threaten and intimidate investigators, have been selling political favors to rogue nations, have engaged in violent “bird-dogging” mob-manipulation tactics at Trump rallies, have worked to implement systems of election rigging throughout the country, and have even tried to falsify intel suggesting Trump is a Russian spy. Absolutely corrupt as they come. This brings us to the second lesson of this election season, that evil is attractive. The Clintons have been liberal darlings for decades, but now they will forever go down in history as some of the most corrupt individuals in American history, casting a long shadow on both theirs and Obama’s political legacy. I try to be objective when watching both sides of the political debate. Meaning they both can’t be trusted. But watching the unraveling of not only the Clintons but also the DNC has been oh so satisfying. I can’t help but think that at some point young Hillary Clinton made a deal with the devil, and in this election cycle he has come to collect on that contract. Hillary has been in government for a longtime and has had tremendous opportunity to do good, but has instead only done wickedness. I would say the Clintons are the perfect example of a power couple that has sold themselves to wicked institutions and power. They are without question the benefactors of a demonic system that has allowed corruption like theirs to proliferate like cancer. The lesson here is to take note at how our systems of government have allowed this corruption to continue uninterrupted for decades and decades without contest. Political institutions by default are horribly corrupt and twisted against the interest of the people. We simply can’t begin to understand how God has allowed so many alternative media personalities and outlets to arise that are capable of exposing the criminality of the political elite like the Clintons, but we just witnessed it all unfold. We must remember that the enticing things of this world are fleeting especially if gotten by lies, and evil. There is a judge that sits in Heaven and when judgment comes it comes swiftly and suddenly. People should be besides themselves in rage at what the Clintons and others have been caught doing. Government’s only purpose is to promote justice and the general welfare of its citizens. Instead the Clintons have used government to enrich themselves through the selling of political favors. Looking at the Clinton mafia you quickly realize that EVERYONE was in on it too. This power structure that was available to the Clintons spanned from the private sector into government almost seamlessly thanks to the Obama admin insiders in the DOJ and State Department they were connected to. These insiders were willing to even cover-up for Hillary on multiple occasions. Our ability to maintain good government will always come down to the will and the oversight of the people itself. God hates those who work against the systems of justice in any given political system, and he tells us in his Word that we are to destroy them that speak leasing, an old English word for deception and lying. Government is only as good as the people it is made up of. God’s hand of justice comes from the most unlikely of places. This 2016 it came from people like Alex Jones, a hard-headed Texas radio Host known for his incredible documentaries and fiery personality. He has been on record condemning the world elite since the 1990’s and is very accurate in his analysis. It came from the Breitbart journalist Milo Yiannopoulos, a gay Trump supporter who has been a constant thorn in Hillary’s side and also a huge opponent of the PC culture that so dominates liberal politics. It came from Julian Assange at Wikileaks, a political whistleblower who has released countless thousands of emails revealing the inner works of the corrupt DNC and Clinton people to their ruin. It has come in the form of James O’Keefe of Project Veritas, whose team went undercover and exposed the DNC political operatives that were paid to create mob violence and rig the votes for Hillary. There is no question that God can rise up anyone, whether they be a Godly person or someone from a fallen secular bent to bring judgment on them that He deems as wicked enough to deserve His justice and wrath. This too is a spiritual lesson, though we may not agree with Alex Jones, Milo or Julian Assange there is no doubt that God has used all of them to bring the Clintons to their knees in a divinely perfect way. A way that truly exposes their criminality to all. What can we take away from this election season? I think the main point is to know that no matter how bad things get, and no matter how entrenched evil seems to be in a system that we must wait on God. The Bible says that God is slow to wrath, but when he drops the hammer it decimates whomever is on the receiving end. In this case the Clintons. We can only hope that the investigations and a possible Trump presidency will continue to unravel the sanctuaries of darkness that have embedded themselves into the government system. We can’t kid ourselves into believing that just because the Clintons have been exposed that that is the end of the corruption in government, hardly. They are just a small factor in a larger network of evil. Within the last two years speculation has arisen that if Hillary Clinton does not win the Presidency, President Obama will declare Martial Law before Trump takes the oath for office, thereby remaining the President. This article published by the End Times presents an in-depth view of this coming event. It is intimidating to say the least but knowing that God is in control is a comfort to those of us who name the name of Christ. Although this article is lengthy, I have added (in Parenthesis) personal comments to further educate my readers. “What’s the Purpose of Martial Law in America? When you read what’s been going on while you’ve been busy sleeping, it should send chills up your spine. This is not some happenstance possibility; it’s a diabolical plot to destroy the America that has existed for over 200 years. There was an amazing speech given at the RNC Convention on July 20th. The stirring presentation brought cheers and standing ovations like as has not been seen since Ronald Reagan stood on that same platform many years ago. The crowd loved the speaker, they chanted his name. He was speechless. After recovering his composure, he gave a heartfelt oration of the matters close to his heart. Sadly, the only thing that the Liberal media can focus on is that this man of conviction chose not to endorse the party nominee for President of the United States. Trump’s campaign saw Cruz’ speech and signed off on it. Transcripts of the speech showed he gave it verbatim from the prepared text but for an ad-lib line he closed with at the end which didn’t change its message. And behold, there was a great earthquake: for the angel of the Lord descended from heaven, and came and rolled away the stone from the door, and sat upon it………and the angel said unto the women, Fear ye not: for I know that ye seek Jesus, which was crucified. He is NOT here: for He is Risen, as He said! And very early in the morning the first day of the week, they came unto the sepulchre at the rising of the sun. And they said among themselves, Who shall roll us away the stone from the door of the sepulchre?……………Ye seek Jesus of Nazareth, which was crucified: He is Risen; He is NOT here! 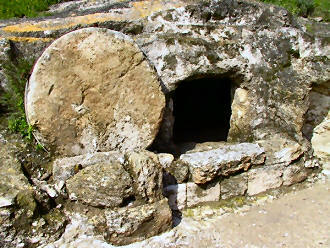 And they entered in and found not the body of Jesus………….Why seek ye the living among the dead? He is NOT here, but is risen:……..And they remembered His words. The celebration of the resurrection of the Lord Jesus is founded upon these verses of scripture. Initially for those who came to the tomb it was a sad, solemn scene. Someone had stolen the body of Jesus! Confusion and disbelief swelled within their hearts. It was only after the angel of the Lord reassured them that Jesus had risen that their hearts settled within and they were able to remember the words which the Savior had spoken unto them concerning his rising from death. As the word spread abroad and the disciples actually saw Jesus did they fully comprehend with joy the reality of the resurrection. What a joyous occasion indeed! 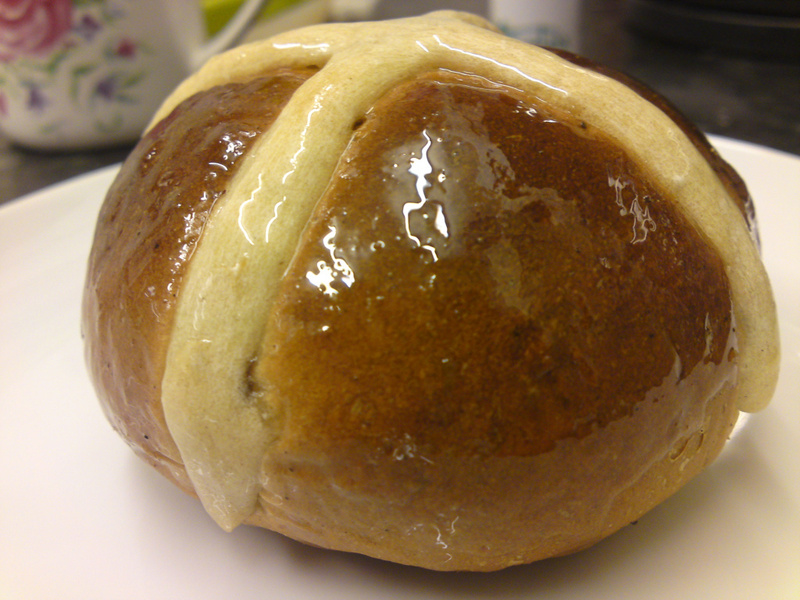 The vast majority of ecclesiastical and secular historians agree that the name of Easter and the traditions surrounding it are deeply rooted in pagan religion. When the Puritans came to America they regarded the celebration of Easter as well as the celebration of Christmas with suspicion. Not until after the Civil War did Americans begin celebrating this holiday. Easter became and American tradition in the 1870’s, and entire century after its founding! Lent: There is not instruction in the Bible to observe Lent. In ancient times a forty day abstinence period was observed in honor of pagan gods Osiris, Adonis, and Tammuz. It was observed in the spring of the year and culminated with a day of feasting, honoring the resurrection of their god, Tammuz who was brought back from the underworld by his mother/wife, Ishtar. Yep, this god married his own mother. Yuk! Ishtar was actually pronounced Easter after whom the festival was named. Easter Eggs: The origin of the Easter egg is based on fertility lore of the Indo-European races. The egg was a symbol of spring and it became ‘Christianized’ by bestowing upon it a religious symbol of the rock tomb out of which Christ emerged to the new life of His resurrection.Colorful eggs have been very prominent symbols of new life and resurrection in European and Middle Eastern pagan spring festivals. Sunrise Services: Sunrise services are mentioned in the Bible. In Ezekiel 8: 13-18, the Lord describes to Ezekiel, a group of men having their backs toward the temple of the Lord, and their faces towards the east; and they worshipped the sun toward the east. This vision is a prophecy concerning the sins of God’s people in our time. Observing sunrise services is serious to God in that he said to Ezekiel that it was not a light thing that the house of Judah committed these abominations which provoked God to anger; the abomination of sun-worshipping. Easter Bunny: And then there is the Easter Bunny! The Easter Bunny has never had religious symbolism bestowed on its usage, nor is it connected to anything Christian, let alone the Bible. 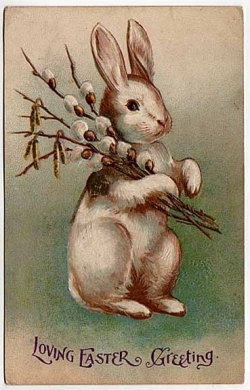 The Easter Bunny had its origin in pagan fertility lore and from the ‘hare’, the symbol of fertility in ancient Egypt. Sorry, kids, but the Easter Bunny does not lay eggs! Truth and logic have been lost in this tradition and the merging with Christianity makes an already idolatrous practice worse. The entire concept that these symbols are ‘Christian’ is a lie foisted on innocent children. Hundreds of millions observe idolatrous feast known as Easter, believing themselves to be honoring the Lord Jesus Christ, instead of the sacred observance of His resurrection. The actual reason for the season is to remember the death, burial and resurrection of our Savior; not the idolatrous commercialization of Easter.